As a teacher, I find myself on an eternal quest to find a stimulating, original theme to link areas of learning for my pupils, which holds sufficient breadth to avoid the need for tokenistic links that end up making little sense to the children and even less sense to me! In the past I have found myself straight-jacketed by agreed whole school topics that were driven by one subject….the result being that I actually ended up completing virtually dissertation level research into obscure Victorian explorers to try to find some semblance of a link between the ‘given’ history theme of the said Victorian Explorers and the geography topic of The Amazon?!? Hours of my life that I will never get back and a process I have sworn to never enter into again as a result. This has resulted in me scouring book shops, blogs, Pinterest and social media for rich learning contexts which have enough inbuilt freedom to link the sometimes disparate aspects of the curriculum in a meaningful way. On rare occasions you discover high quality texts which emit an almost mythical call to teachers everywhere…..use me and your pupils will love learning whatever you throw their way! 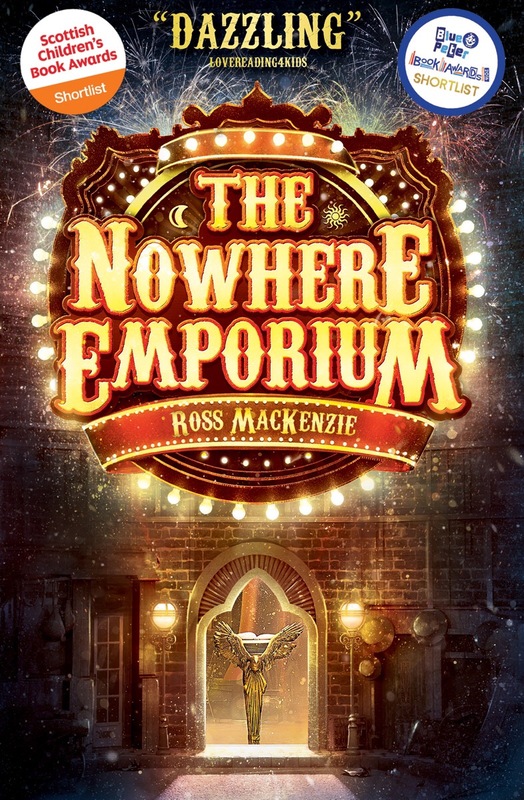 ‘The Nowhere Emporium’ by Ross Mackenzie is one such text that emanates with this ethereal educational glow! I couldn’t possibly be tempted to give the plot of the book way….it must be experienced to truly appreciate the magic of the story but I will at least allude to some aspects to exemplify how this text could be a godsend for cross-curricular learning. The story itself is centred around the eponymous Nowhere Emporium; a magical shop which can travel through time and space holding endless wonders behind the myriad of doors that festoon the labyrinthine hallways. This very fact makes it the perfect vehicle for cross curricular learning as, regardless of historical period, geographical context, artistic theme or mathematical skill…the Nowhere Emporium can go there with you. At the same time, the story itself it a true wonder to read. The story is dripping with powerful language, emotive descriptions and wonderful characterisation, providing a multitude of opportunities to use the book as he center of English reading and writing development. I am already buzzing with the thoughts of how I am going to integrate the story into my teaching during the new academic year! I am immediately determined to transform my classroom into a version of the Nowhere Emporium; red velvet curtains draped over my stock cupboard door with gold lettered ‘Hall of Wonders’ sign, where I will be regularly ‘finding’ the latest unusual object, letter or image provided by the magics of the Nowhere Emporium….which will magically link to our curriculum for the term, our very own Book of Wonders to capture examples of amazing learning, oustanding behaviour and home learning tasks and maybe even a desk/bureau for the Emporium’s Mr Silver to work at when he visits in our absence…which could also luckily double up as the class writing area! I can also see myself scouring eBay to find some unwanted roles of ‘library shelf’ event wall paper to really help transform my classroom into the dusty curiousity shop that is the Nowhere Emporium. The author, Ross Mackenzie, is a true master of his art. A book written for children which can also fire the imagination of adults is a rare creature and I, for one, am greatly appreciative that he has chosen to share his wonderful story with the world! You MUST get yourself a copy….it will be your ticket to cross the threshold of the Nowhere Emporium and you will never want to leave!